Figure 1. These assembled cabochons (1.74–10.57 ct) with multicolor iridescence are a skillful imitation of rainbow moonstone. They are composed of a natural rock crystal quartz base with an iridescent coating cemented to a gypsum top, and the entire assemblage is coated in colorless plastic. Photo by Don Mengason. The Carlsbad laboratory recently received for examination four semi-transparent to translucent cabochons with a white bodycolor (figure 1), ranging from 1.74 to 10.57 ct. 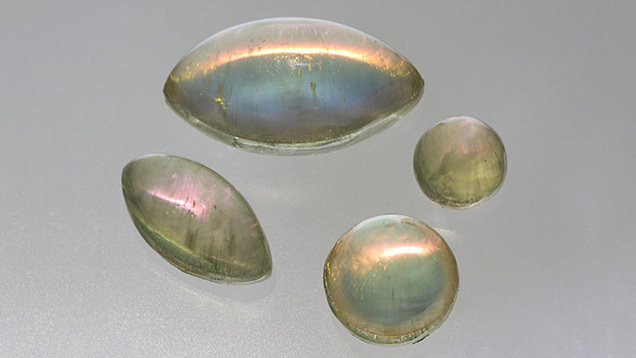 These stones appeared similar to white plagioclase feldspar with multicolor iridescence, known in the trade as “rainbow moonstone” (Summer 1997 Gem News, pp. 144–145). However, a cursory examination proved they were distinctly different: assembled materials composed of a colorless, transparent base cemented to a fibrous white top and coated with a colorless plastic. The stones also displayed an unusual iridescence. The colorless plastic coating had an RI of 1.55, but this was not useful in identifying the substrate components. The assembled stone fluoresced medium blue to long-wave UV and weak blue to short-wave UV. In polarized light, a bull’s-eye optic figure was resolved in the colorless base material, confirming rock crystal quartz; small fluid inclusions and reflective particles in the bottom sections indicated natural origin. Raman spectroscopy conclusively identified the fibrous top as gypsum. Microscopic examination revealed an iridescent coating on the quartz section, much like that used on “Aqua Aura” quartz (Fall 1990 Gem News, pp. 234–235). Closer inspection revealed that the iridescent coating was located on the quartz in the join. The colorless plastic coating contained numerous gas bubbles and was easily deformable with a pointer probe. This plastic layer was apparently added to give a vitreous luster to the otherwise dull, waxy gypsum. Gas bubbles in the colorless cement layer made it quite easy to recognize these stones as assemblages. When viewed face-up, the assemblages made an attractive imitation of rainbow moonstone due to their white bodycolor, milky appearance, and rainbow iridescence. This is the second time the Carlsbad laboratory has examined an assemblage containing plastic-coated gypsum (Fall 2012 Lab Notes, pp. 210–211). Coupling a luster-enhancing coating with an iridescent layer created an interesting imitation rainbow moonstone from two common materials. Amy Cooper and Tara Allen are staff gemologists, and Nathan Renfro is lead analytical specialist of gem identification at GIA’s laboratory in Carlsbad, California.